Product #21314 | SKU 18921 | 0.0 (no ratings yet) Thanks for your rating! 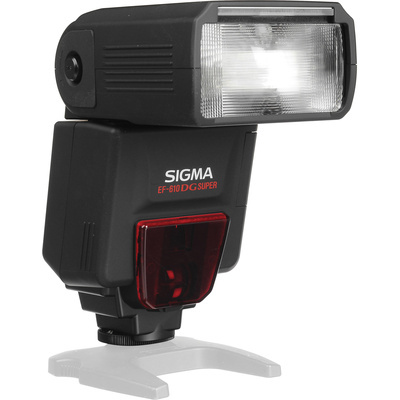 With a powerful guide number of 61 m at ISO 100 and 105mm, the Sigma EF-610 DG Super Flash works with Sony/Minolta ADI / P-TTL and offers users the ability to illuminate the subject or scene both on camera and off. The unit also has a zoom range of 24-105mm with full frame cameras and has a wide-angle panel that will extend this to 17mm. The head will tilt from -7 to 90° and rotate right 90° and left 180° for full bounce capabilities. And, it has wireless master and slave TTL functionality. Other features included in the EF-610 DG Super are a multi-mode for stroboscopic work and a modelling flash to easily view your light before taking the shot. The flash also offers high-speed, first and second curtain sync modes as well as a 5 to 7 second recycle time at full power. Additionally, it runs on 4 AA batteries and comes with a stand a case. This flash features the Sony/Minolta Auto-Lock Accessory Shoe and is not compatible with the newer Multi Interface Shoe. The ADP-MAA Shoe Adapter is available for using this flash on a camera featuring the Multi Interface Shoe.